Star Bill of Lading is a program developed by Starre Enterprises, Inc.. We know of versions 8.8, 7.8, 7.0, 6.4, 5.0, 4.0, 3.0, 2.5, 2.1. Version 8.82 is downloadable at our site. Star Bill of Lading installation file has a size of 15,003,570 bytes. 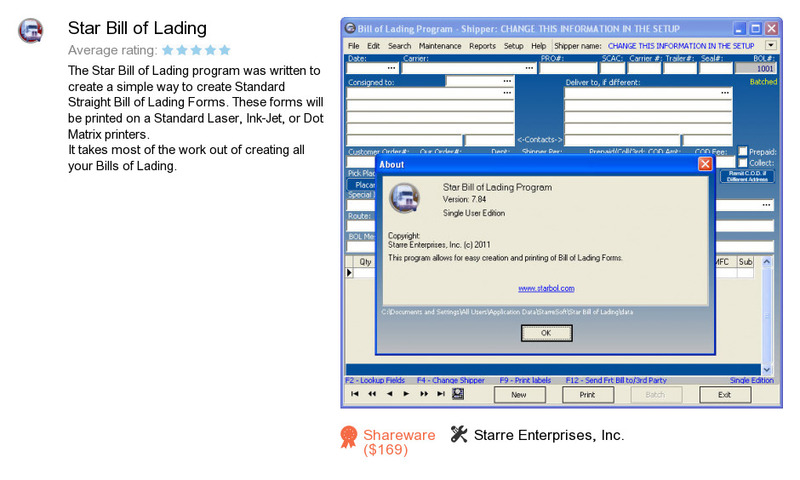 Starre Enterprises, Inc. also publishes Star Check Writer and Star Fax Cover Sheet Creator.